“The theme, ‘Women First, Prosperity For All’ makes this edition of GES stand out. In Indian mythology, women are an incarnation of Shakti- the Goddess of power. We believe women empowerment is vital to our development.”- PM Modi at GES 2017. This week, amidst much fanfare, India and the USA co-hosted the eighth annual Global Entrepreneurship Summit. Inaugurated by Prime Minister Narendra Modi and US Presidential advisor, Ivanka Trump, the government was banking that the event would burnish U.S. trade and investment in India. With 1500 entrepreneurs who had won places as delegates in the conference, the event provided an opportunity for them to network and gain the ear of influential stakeholders in global business, including politicians and other government officials as well as investors and heads of American, Indian and international conglomerates. The interactions held out the promise of business relationships to be forged, deal signings in the offing. But this must have come as small comfort to the some six thousand beggars, squatters and hawkers, forced from sidewalks and street corners – to ‘rehabilitation centres,’ by the Hyderabad Municipal Corporation. While far from being concentration camps, human rights groups have said the move impinges on mobility rights. Stray dogs, it appears have suffered a more odious fate. Residents claim that local canines were rounded up and then poisoned in advance of the summit. Meanwhile, the United States’ champion of female empowerment was getting ‘recharged’ courtesy the Government of India’s royal treatment. Greeted at the Taj Group’s Falaknuma Palace with a shower of rose petals as she descended her horse-drawn carriage, Trump was treated to a five-course meal with Narendra Modi and other VVIPs. With one hundred and one place settings, Faluknama Palance boasts the longest dining table in the world. Aside from Modi and Trump, other guests included: Telangana Governor E.S.L. Narasimhan, Chief Minister K. Chandrashekhar Rao, ICICI CEO Chanda Kochhar, Niti Aayog CEO Amitabh Kant and Tata Sons Chairman N. Chandrashekaran. Each guest was assigned a Sherwani-clad private butler – and a gong (no joke) was sounded between each course to signify the changeover! The elaborate menu created by Executive Chef Sajesh Nair contained rare Indian flavours including sandalwood, saffron, and figs. “Our chefs have worked tirelessly to recreate a unique dining experience from the Nizam’s kitchen and we are certain to create memories for PM Modi and Ms. Trump that will last a lifetime,” said Ritesh Sharma, GM, Taj Falaknuma Palace. Rare artifacts and silver decorative pieces were brought in from the erstwhile Nizam of Hyderabad’s private collection, normally displayed at Chowmahalla Palace. 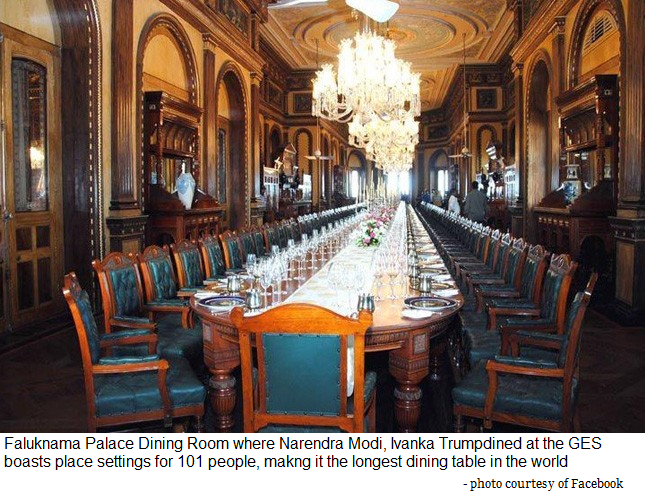 The irony of two figures known for their avarice towards Muslims devouring a traditional Mughal feast using silverware that belonged to a Muslim king, was not lost on onlookers. Hyderabad was awash in ironies during the summit: a rising tide, it appears lifts some boats and sinks others. Trump’s speech was broadcast live via Doordorshan and other news outlets, garnering almost as much attention as Independence Day or Republic Day speeches. “As a former entrepreneur, employer, and executive in a male-dominated industry, I’ve seen firsthand that all too often, women must do more than their male counterparts to prove themselves at work, while also disproportionately caring for their families at home ” Trump said in her speech, which according to Yahoo News was largely recycled from a talk she gave in Tokyo, Japan earlier in the month. A senior advisor to President Donald J. Trump, Ivanka Trump stepped back from day-to-day management of her brand before taking on an the official role – but still retains an ownership interest. “After my father’s election, I saw an opportunity to leave my businesses for the privilege of serving our country, and empowering all Americans to succeed,” she said added. That Ivanka Trump’s father wants to revive the US Coal industry runs counter to efforts of Camalova and others like her to rid the US and other countries of polluting energy sources. And, continuing to power one-third of homes, coal seems an undeserving charity case. With the US having pulled out of the Paris Accord and the words “Climate Change” disappearing from government websites, an apparent directive from Trump appointees, coupled with President Trump’s now infamous tweet that, “the concept of global warming was created by and for the Chinese in order to make U.S. manufacturing non-competitive,” – entrepreneurs like Camalova might well wonder how deep Ivanka Trump’s support runs. In fact, the first daughter’s own words on women’s empowerment surely ring hollow to the Chinese women who make the clothing, shoes, handbags and the like for her Ivanka Trump apparel line. The women laborers at a factory in China that sources the brand earn a mere $1 an hour, a recent audit cited by the Washington Post states. According to The Post, “inspectors with the Fair Labor Association…found two dozen violations of international labor standards during a two-day tour of the factory in October, saying in a report that workers faced daunting hours, high turnover, and pay near or below China’s minimum wage.” The Post concluded that her company, “lags behind many in the apparel industry when it comes to monitoring the treatment of the largely female workforce employed in factories around the world”. Abigail Klem, president of the Ivanka Trump brand, has called supply chain integrity “a top priority,” but the brand has not joined the growing number of companies that publicly identify their manufacturers. True to form, father and boss, President Donald J. Trump praised her speech, saying “Great work Ivanka!” in a tweet late Tuesday in which he shared a US State Department video of her remarks. 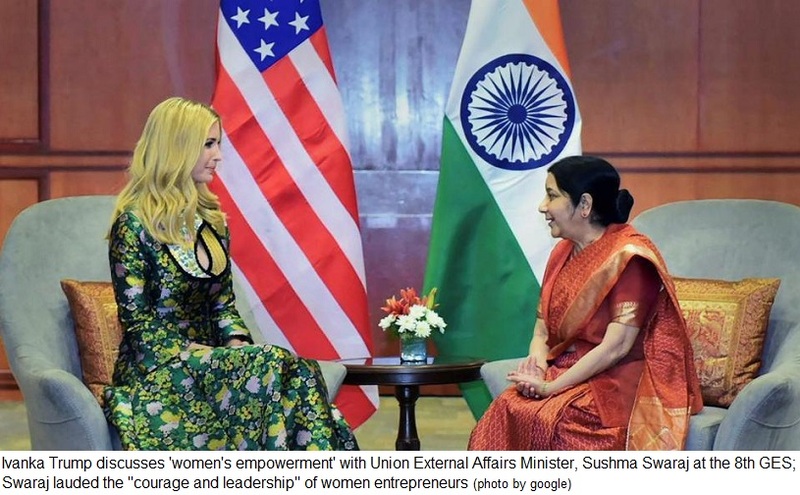 Appearing hand-in-hand after a session on women’s entrepreneurship, External Affairs Minister Sushma Swaraj also appeared to laud Ivanka Trump, saying, “Women entrepreneurs are an epitome of courage and leadership.” She added that India appreciated the efforts of the US to promote entrepreneurship globally. She said she had no doubts that on PM Modi’s and President Trump’s leadership, entrepreneurship would reach new heights. Other speakers included Chhanda Kochar, CEO ICICI Bank and Cherie Blair, Queens Counsel and mentor on women’s issues as well as spouse of former British Prime Minister Tony Blair. Blair said, “Women need the 3C’s- Confidence, Capabilities and access to Capital. Also men must understand that women are their equals.” Kochar highlighted progress of made by professional women in the nation, saying, “India is faring better than many countries in allowing women entrepreneurs to excel.” She cited the statistic of 40% of the banking sector being headed by women to support her claim. While the Central and State government in Telengana celebrate the success of the GES, Indian start-ups appear uncertain of the results. Though the aim of the Summit was simply to nurture innovation and entrepreneurship with benefits only to be reaped down the line, the government claimed 40,000 direct contacts were exchanged during the three days of the summit. 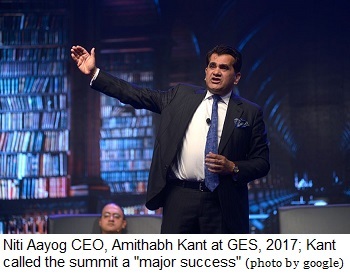 Indeed, Niti Aayog CEO Amitabh Kant said the GES was a “great success,” adding that 11,000 meeting requests were shared on the GOQii app that was made available for the delegates. Others such as Aditi Balbir, founder of resort management company V Resorts complained that investors and mentors were not readily made available to delegates seeking investment or advice. Speaking to the Business Standard, Balbir said he was keen to meet Kalaari Capital managing director Vani Kola at the Global Entrepreneurship Summit in Hyderabad. Balbir, whose company has so far raised $7 million, sat through the Wednesday session where Kola was a panelist. “The investors came and left. There was no way to talk to them. Some of them got busy with media interactions after their sessions. The Summit did not have a format where start-ups could connect with the investors,” Balbir lamented. That delegates saw the summit as an opportunity to raise money was an unreasonable expectation, according to some. “The government and people here did an amazing job to put up a warm welcome. This might not be a platform to connect investors with entrepreneurs. The best thing entrepreneurs could get from investors here is how to better approach an investor,” said Folabi Esan, partner with Adlevo Capital, a Lagos-based investor. Upasan Taku, co-founder of the online payment portal, Mobikwik agreed. “There was a pitching set-up but it was not very well set-up. So, that part was left informal. This event was more about sending a message of collaboration and entrepreneurship to the world,” he said. 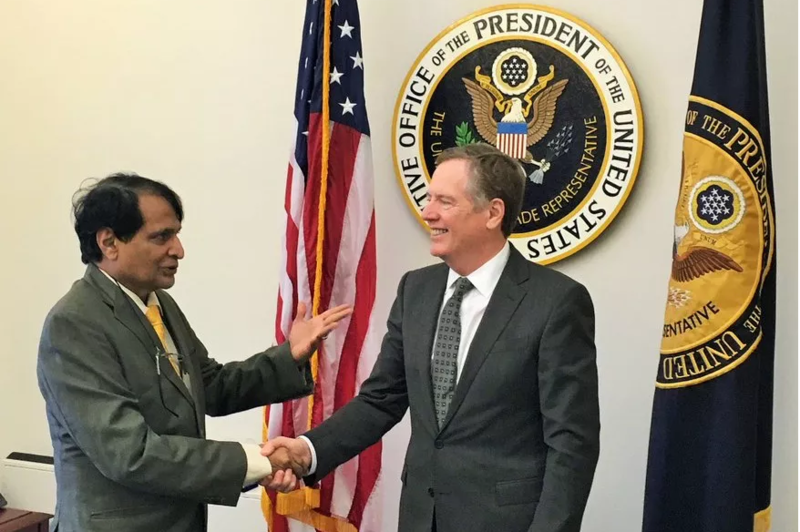 While the co-hosting the GES in an Indian city was meant to boost trade between the India and the USA, the state of the Indo-US trade relationship appears to have entered an uncertain phase. When Prime Minister Narendra Modi was elected in 2014, he committed further opening India’s economy. That same year, Modi’s government launched “Make In India” with to attract foreign investment. The manufacturing sector has seen an upswing since the program was announced. But for foreign investors, many of the outcomes promised have yet to materialize; rather, hurdles meant to keep foreign businesses out have not fallen. 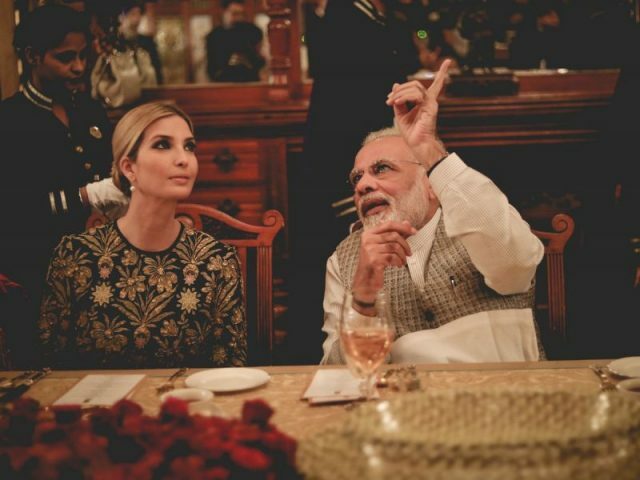 Narendra Modi and Ivanka Trump’s personal affinity aside, the key players negotiating agreements on trade between the two nations, are the negotiators led by Indian Commerce Minister, Suresh Prabhu and US Trade Representative (USTR) Robert Lighthizer. The teams failed to come to terms in late October on a range of issues when Prabhu made an official visit to Washington. The gap between the two envoys was so wide that a planned joint-statement on trade between the two countries was torpedoed. “Both sides had differing views that could not be resolved immediately,” the US statement noted after the meeting. In diplomat-speak, such words, made without reference to the overall bilateral relationship, are downright confrontational in nature. The Trump administration is of the view that the near $30 billion trade deficit of the US with India is due to discriminatory trade barriers against its companies while India maintains it conducts its trade policy in a non-discriminatory and transparent manner. Of concern key concern recently are recent caps placed on medical devices such as cardiac stents and artificial limbs – a market in which US companies compete. This is an industry in which, with the advent such new technologies as 3-D printing, Indian manufacturing is trying to establish a beachhead. Not to be outdone, American pharmaceutical companies complain about the intellectual property regime in India, and the growth of the local generic industry – a source to which, increasingly, American patients, wary of rising drug costs seem to be turning. Also, many US observers were taken aback when, this fall, the Indian Railways ministry abruptly reversed a 2015 decision to buy $2.6 billion worth of diesel locomotives from GE, telling the American blue-chip company, it was no longer interested in diesel engines. Despite having thriving business interests in India via The Trump Organization, President Trump has taken notice. Having taken stands against free trade agreements to his domestic constituency, Trump said this to Modi, last June: “It is important that barriers be removed to the export of US goods into your markets and that we reduce our trade deficit with your country,” Officials said his statement was made in the context of seeking a relationship that was “fair and reciprocal,” which sounds a lot like free trade. Moreover, India has begun importing US crude oil and will do the same with liquefied natural gas next year. A statement by the Indian Commerce Ministry in October, said that SpiceJet and Jet Airways are buying more that 300 aircraft from Boeing worth billions, implying that the sale would make a dent in US-India trade deficit. Organizers hope that the GES summit and further business-to-business engagement will do a better job than government officials to help re-invigorate the trade relationship. They may be right. Putting like-minded entrepreneurs in touch and giving them support may well be more effective than relying upon the administrations of two bellicose leaders to come to terms on international policy.